Meet & Greet with September Mourning and The Reapers at Mile High Comics, Denver, Colorado. They will be performing a short acoustic set and will be taking pre-orders for their graphic novel that will be released on January 16th. Free event. 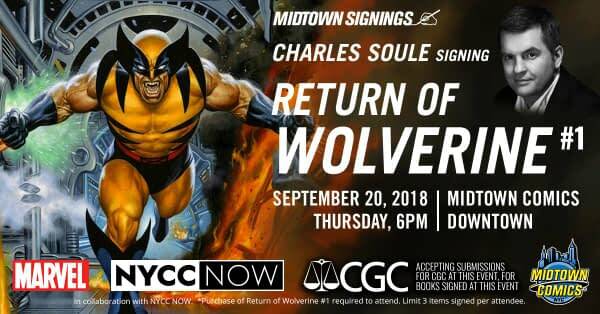 Return of Wolverine #1 signing with Charles Soule at Midtown Comics Downtown in New York. 6pm-8pm. Graphic Novel Discussion – Goldie Vance at Empire’s Comics Vault, Sacramento, California, 6.30pm to 8pm. Barbican Comics Forum, Barbican. 5.30pm-7pm. A fun and informal book group dedicated to the understanding and enjoyment of the multifaceted medium of comic books and graphic novels. Jason Walz, comic creator of Last Pick.